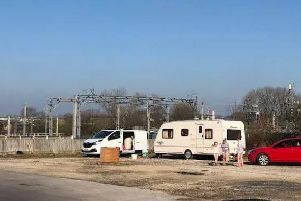 Travellers are refusing to leave the car park area of an old pub in Euxton. Bailiffs are at the former Railway Pub in Wigan Road to evict the group this morning. READ MORE: How quickly can the council evict travellers? The group of travellers who moved onto the site at around midday yesterday with three caravans were told last night that they had until this morning to leave.